A cheeky toddler showed she had more important things to do than listen to Prince Harry ramble on as the royal visited her home in Australia. Harry, 34, and Meghan, 37, were charmed by little Ruby Carroll and couldn’t stop making a fuss of her.But after gazing at the duke, adorable Ruby appeared to prove the feeling wasn’t mutual and decided she’d had enough. The 13-month-old was filmed plodding off in the garden as the duke was mid-sentence, but he didn’t seem to mind and continued speaking to the tot’s family. 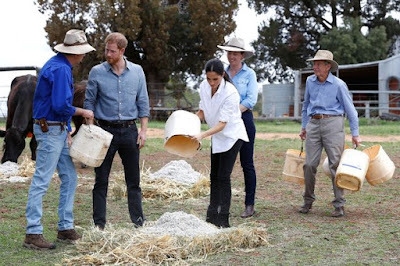 The cheeky encounter came as the royal couple made a pit stop at the Woodley family’s farm as part of their royal tour in Dubbo, New South Wales, to learn about the devastating Australian drought. And pregnant Meghan even brought a gift of homemade banana bread. The Woodley family have been farming at Mountain View farm for five generations. 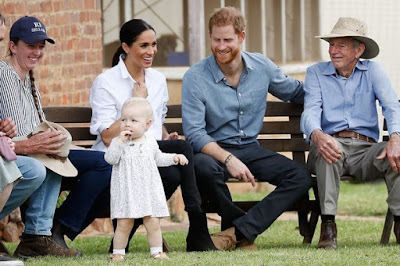 Ruby was the star of the show over tea in the garden, where the extended family gathered for a relaxed chat with the Duke and Duchess of Sussex. After making a fuss of Ruby, Meghan spoke to the toddler’s mother Emily Carroll, 33, about her own pregnancy. “They both had a little tickle with her [Ruby],” Mrs Carroll said. “She’s normally in bed at 10.30am but we had to stay up for this. She’s done so well. “Meghan told me that she’s feeling pretty good so far, which is great, and that she’s running on adrenaline. “She said they’re doing 76 engagements in 16 days, with maybe one rest in the middle.